Valley Cottage, N.Y. – (11/17/15) –Senator David Carlucci (D–Rockland/Westchester) was joined by Stephanie Madison, President of the Mental Health Association of Rockland, Glenn Liebman, CEO of the Mental Health Association of New York State, and community advocates to urge Governor Cuomo to sign bill S.632A into law. In the United States, one out of five individuals live with a mental illness, and nearly two-thirds of those diagnosed with a mental illness do not seek treatment. This startling statistic is due to the stigma that exists when discussing mental illness, which can lead to fear of diagnosis and hesitation in getting the help that they truly need. Senator Carlucci’s bill currently awaits Governor Cuomo’s signature. This vital legislation would create the “Mental Illness Anti-Stigma Fund,” which would provide an easy way for New Yorkers to support essential mental health educational programs and services. Funded by a tax check-off box that would appear on New York State income tax forms, the “Mental Illness Anti-Stigma Fund” would contribute to critical programs that work to eliminate mental health stigma and lead to a better understanding of mental illness by all. To raise awareness of this vital fund and encourage supporters, Senator Carlucci has launched an online petition to urge Governor Cuomo to sign this important legislation into law. Supporters can also use the hashtag #FightMHStigma on Twitter and Facebook to ensure their voices are heard. “Stigmas associated with mental illness have resulted in feelings of embarrassment and denial that prevent those in need of treatment from receiving it. No one should ever be ashamed of having mental illness, and I am calling on Governor Cuomo to sign this bill into law. By signing, New Yorkers can directly help end these stigmas by making a tax-free donation that will fund mental health public awareness campaigns across the state. 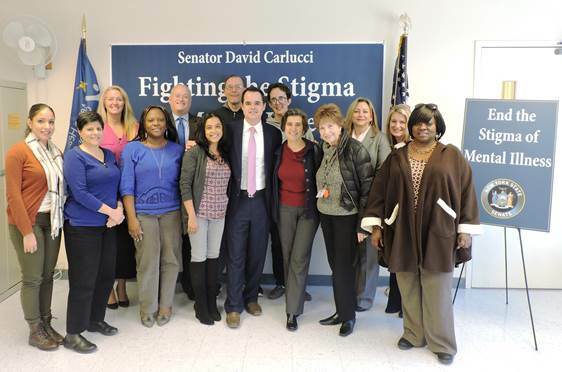 I want to commend the Mental Health Association of New York State and the Mental Health Association of Rockland for their advocacy on this important piece of legislation and all those who made their voices heard in Albany,” said Senator Carlucci. “Two out of every three people in the United States who need mental health care never seek services and the number one reason they cite is the stigma of the illness. Until we break down these walls of stigma and discrimination, people will never get the support and services they need and the negative perceptions about people with mental illness will continue. We have strong bipartisan leadership that has led to the bill’s passage through Senate sponsor David Carlucci, Assembly sponsor Aileen Gunther and Senate Mental Hygiene Chair Robert Ortt. We urge Governor Cuomo to help fight the stigma of mental illness by signing the mental health public awareness tax check off bill into law,” said Glenn Liebman, CEO of the Mental Health Association of New York State. “The Mental Health Association of Rockland is proud to partner with Senator Carlucci and Assemblywoman Gunther to promote the passage of The Mental Health Public Awareness Tax Check Off Bill. We are all too aware of the fact that nearly 2/3 of people living with behavioral health issues live in silence regarding their challenges, largely due to the stigma attached to mental illness. We must come together, as a community, a state, and a nation to raise awareness, improve access to quality care, and ensure that all those living with mental health issues are treated with respect, dignity, and kindness,” said Stephanie Madison, President of the Mental Health Association of Rockland. For more information please contact Justin Devendorf (315) 491-7564.